A drug-plagued thief has been spared from jail so he can be given an opportunity to move into a rehabilitation unit to beat his addiction. 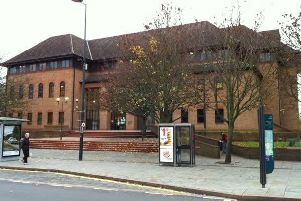 Chesterfield magistrates’ court heard on Friday, July 1, how Steven Curran, 40, of King Street, Alfreton, was spotted stealing toiletries worth £59 from Boots Chemist in Alfreton and was identified from CCTV footage. Prosecuting solicitor Ian Shaw said: “One of the staff at the chemist’s saw Curran outside and she was aware he was a shoplifter as he came into the shop. CCTV was checked and showed the toiletries had been taken, according to Mr Shaw, and no attempt was made to pay for them so police attended his address. Curran told police he had met someone before the theft and he had a debt with them and the items were stolen to pay off that debt. The defendant who has previous convictions for shop theft pleaded guilty to stealing the toiletries after the offence on May 20. Defence solicitor Mr Last told the court Curran has recently met with Derbyshire County Council for funding for a residential rehabilitation programme to overcome drug problems and if he were to go to custody this plan could be put in jeopardy. Mr Last acknowledged that Curran has previous convictions dating back about 15 years related to his addictions including alcohol, which he has overcome, and drugs which he is still battling. But Mr Last added: “What’s important is that he doesn’t lose his liberty and be unable to take up a residential place to which funding has already been agreed. Magistrates agreed to impose a six-month deferred sentence providing he complies with his rehabilitation and he will be re-assessed for sentencing by the court on December 9.